AQ1 has developed breakthrough passive acoustic technology to measure feeding intensity of farmed shrimp and control feeding. 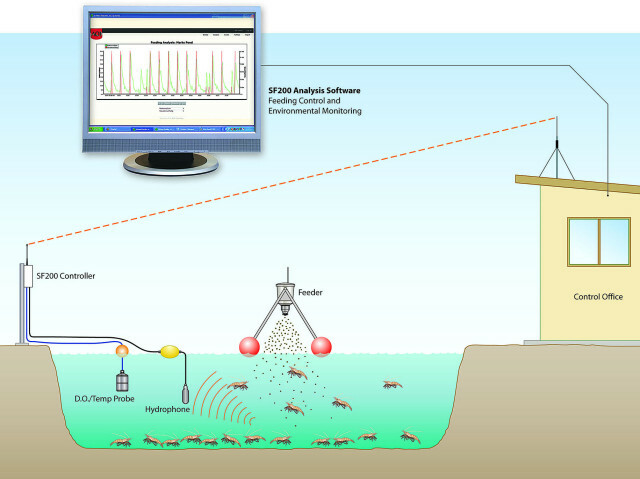 The SF200 Sound Feeding System has complex filtering algorithms to analyse shrimp feeding sounds and Adaptive© Feeding Algorithms to control feed output to match the feed intensity precisely and eliminate waste. The system optimises feed utilisation to improve growth and feed conversion and produce a better quality product. The SF200 system has been used on Black Tiger, vannamei, banana and kuruma shrimp in production and research environments. It is designed to connect with environmental sensors to provide real time environmental monitoring and alarms and can ultimately control aerators to help manage pond conditions. The SF200 connects with a variety of feeders and sends all feeding and environmental data to the operator on the farm through WLAN and remotely through the intenet.